Spanish football teams should have stadiums closed if their fans are guilty of racist abuse, says Malaga striker Roque Santa Cruz. 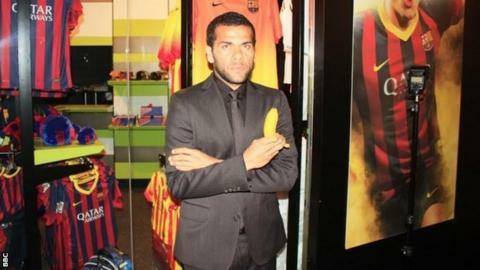 Dani Alves had a banana thrown at him by Villarreal fans last month. "There needs to be something really strict, really tough," Santa Cruz told the BBC World Football Show. "A very big decision from the authorities not to let it happen again, like closing a stadium - something really bad for the supporters." Villarreal were fined less than £10,000 for the Alves incident, in which the Barcelona and Brazil right-back ate the banana in an act of defiance against racism. The following week Levante midfielder Papakouly Diop danced in front of Atletico Madrid fans after scoring a goal having heard monkey chants from the crowd. Paraguay international Santa Cruz, who has played for Blackburn and Manchester City, said: "This is the point where sometimes football and being so fanatical can be really bad for everybody. In normal circumstances I don't think people will act this way. "This is when people make ugly mistakes by saying these things and throwing bananas. It has no space in football or life. "The Spanish football federation needs to be really tough in these circumstances because it's something we need to take out of football. "It needs to be something more aggressive." Listen to the BBC World Football Show on the iPlayer.